It has become a Standard of Care for companies to have AEDs accessible to lower their overall risk management portfolio. Any investment a company makes in their people is not just investing in their career, but in the success and vitality of your business. Protect your number 1 asset…your employees. About 295,000 people suffer Sudden Cardiac Arrest each year in the United States. Only 7-8.5% of people suffering from SCA SURVIVE! This is more than the number who die from AIDS, Alzheimer’s, and assault with firearms, breast cancer, colon cancer, fires, motor vehicle accidents, prostate cancer and suicides COMBINED! In fact, the number of people who die each year from SCA is seven times the number of those who die from breast cancer. The only “cure” for SCA is an electrical shock administered by an AED. By administering a shock with a defibrillator within two minutes of collapse, the chances of survival of SCA are increased by 90%. The chance of surviving SCA with on help is 5%. Waiting for EMS to respond is not enough. Protecting your company and your assets is easy. Chesapeake AED Services is knowledgeable, professional, and has assisted companies in implementing PAD programs and training nationwide. We are the East Coasts largest training facility for the American Heart Association as well as a CORE PARTNER and Authorized Distributor for Physio Control Life Pak AED’s. 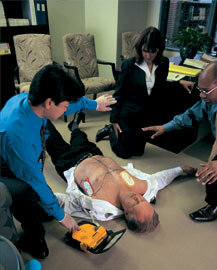 Physio Control, the leader in defibrillation, is the brand that 75% or all EMS/Fire professionals use, know, and trust. Every AED they develop is clinically validated and backed by science.